Most little monsters will bring home a scary stash of candy after trick-or-treating, so it’s not surprising that nearly 1 in 5 Illinois parents say Halloween is one of the toughest times to get their kids to maintain good oral health habits. But don’t get spooked, Delta Dental of Illinois offers parents some tricks and the top treats to keep kids’ teeth safe from sugary nightmares. If an option, sugar-free candy and gum are obvious top choices. Chocolate without sticky fillings is also a better choice than other treats, especially dark chocolate which is lower in sugar than milk or white chocolate. Chocolate dissolves quickly and is not sticky, which decreases the amount of time sugar stays in contact with teeth. 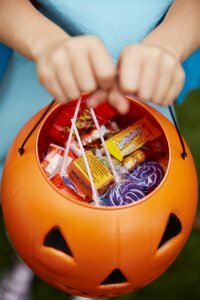 The worst treats for teeth are chewy and hard candies, such as caramels, gummies, jawbreakers and lollipops, because they are likely to spend a longer time exposing teeth to sugar. 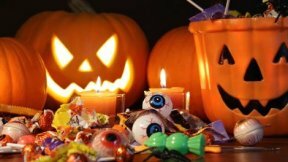 Along with choosing dark chocolate and sugar-free treats, Delta Dental of Illinois offers these five tricks to make your Halloween tooth-friendly.